Choosing a new fragrance can be a daunting affair. Before you run the gauntlet of sales assistants in your local department store or perfumery, here are a few tips to help you make the best decision. 1. Before you venture out to try a new fragrance, think about when you would like to wear it. 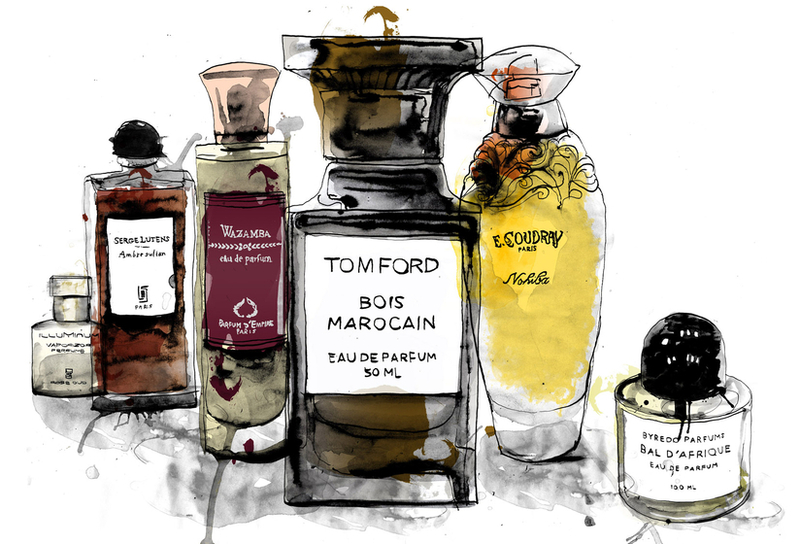 Do you need an everyday fragrance for work? Something to wear on a night out or something to seduce your lover? A work fragrance should be subtle; something that doesn’t asphyxiate your co-workers, whereas an evening fragrance can be headier and a fragrance worn for your lover should be an intoxicating and sensual fragrance. Make sure you do not have any fragrance on your skin, so don’t wear any perfume or scented body cream on the day. 2. Don’t shop for fragrance after lunch or after the gym. Food can affect the way fragrance sits on your skin, and if you’re hot and sweaty after a workout, the rise in skin temperature will change the way fragrance smells on your skin. 3. Remember that fragrance changes on each person’s skin according to the body chemistry. If a fragrance smells amazing on a friend, it might smell like fly spray on you. so make sure you test before you invest. 4. Discuss the kind of fragrance you would like with the sales consultant. Describe the kind of fragrance you would like to experience. For example, light and floral, warm and sensual, fresh and citrus. Ask them to spray three perfumes on to a blotter. The nose can become easily fatigued, so any more than that and you may not be able to appreciate the fragrance. 5. Chose your preferred fragrance and spray it on to your wrist. Never, ever rub or dab the perfume. Believe it or not, this bruises the fragrance. Fragrance should unfold on the skin like a flower. Let it dry down naturally so you experience all of the different notes as the perfumer intended. 6. Let the fragrance sit on your skin for at least 30 minutes. Fragrance companies invest a lot of money in the top notes so it is immediately appealing. I call these notes the money shots. The top notes disappear after 10 minutes, and the mid notes linger for another 20. The base notes begin to appear after 30 minutes and are the most tenacious, so you should ensure that you love the dry down of the fragrance as this is the scent that will remain on the skin. Make sure you go outside to experience the fragrance as department stores or perfumeries can be a chaotic mixture of scents. 7. Once you have found a fragrance you love, purchase a matching body crème or body wash or bath oil. This will ensure the fragrance lasts longer on the skin and the application of the matching products can be a relaxing ritual. 8. Be adventurous! Don’t just chose from the same fragrance family. Fragrance is a reflection of who you are and how you are feeling. A signature scent is a good way to start, however start build a fragrance wardrobe so you have choices for different occasions. The answer is simple, whatever smells good on you. Though I do always recommend that you chose your fragrance according to your environment, and considering it is cold down here in the southern hemisphere, it is a good time to think about a suitable perfume for winter. Winter fragrances should be warm and wrap around you like a cashmere scarf. Think notes of wood, amber and vanilla with a hint of spice. For women, perfumes from the Oriental family are ideal and for men, switch your summer citrus fragrance for one from the Woody family. Fleur Oriental by Miller Harris. Sultriness in a bottle. My beloved winter fragrance. Malabah by Penhaligon's. Understated and elegant, yet warm and comforting. Ambre by Mona di Orio. Sophisticated and very French. M by Pure Distance. Quite simply the essence of masculinity. Feuilles de Tabac by Miller Harris. Men, women will want you if you wear this fragrance. Women, buy this for your man, but don't let him wear it out of the house. Terre de Hermes by Hermes. The perfect fragrance to take you from day to night. Every man should own a bottle.